In 1908 the German railroad inspector August Stauch asked his workers to keep an eye open for “shining stones”. 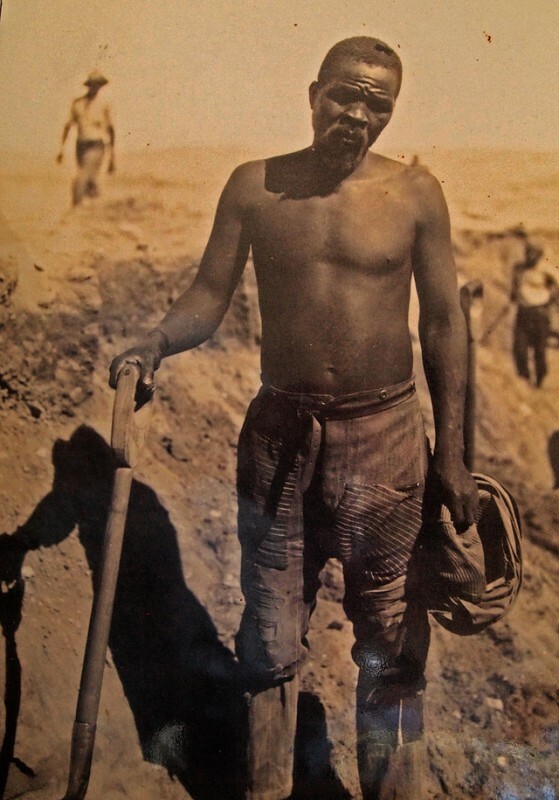 A black worker, Zacharias Lewala, who had earlier worked on the Kimberley diamondfields, found a stone and brought it to Stauch. The stone was identified as a diamond and on 8 April 1908 Stauch took out the first prospecting license. In September 1908 the German Colonial Government proclaimed the “Sperrgebiet” making a large territory along the coastline from the Oranje River all the way to 26 S and 1oo km from the coastline “forbidden land”. A diamond rush followed. In 1909 Stauch found the Idatal (named after Stauchs wife Ida), a valley where the desert winds made the diamonds visible. In the moonlight men were on their knees and hands picking diamonds from the surface. In 1909 mining also started at Kolmannskuppe. The place was named after a British transport driver, called Colman. During a desert storm he managed to survive but had to abandon his ox wagon. His wagon, standing on a hill (kuppe) became a landmark, named Colmans Hill (Kolmannskuppe) and when a town was built next to the mine the old name was kept although it is actually built on another hill opposite the original Colmans Hill. 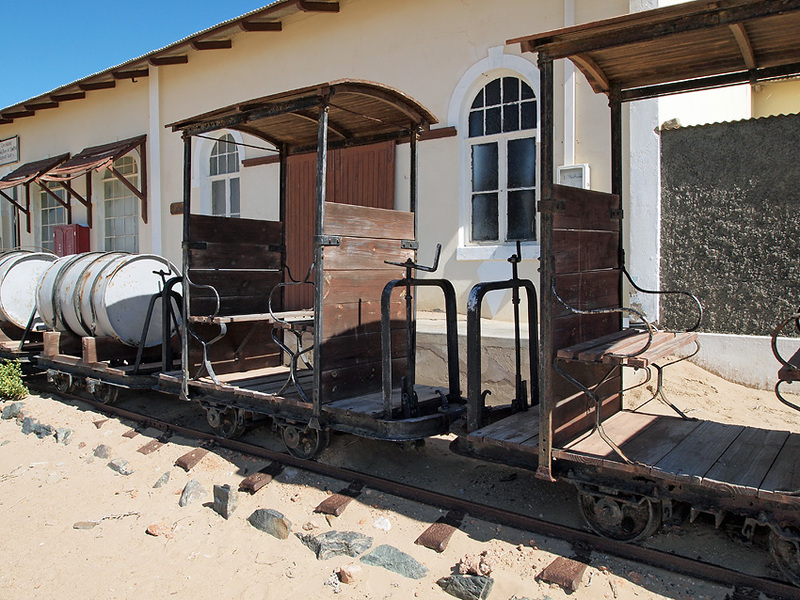 Lüderitz became a rich town with a Stock Exchange in the Kapps Hotel. When cash was short a barmaid could be paid in diamonds. A lot of new buildings were built with most of the building materials imported from Germany. And just outside Lüderitz Kolmannskuppe became a rich mining village. A hospital was built with the first x-ray station of the southern hemisphere. This was motivated not only by care of people becoming sick, but rather by the fact that it could be used to prevent and detect the smuggling of diamonds. …with a skittle-alley, theater and sport hall. There wes a bakery, shops and an ice factory. This little tram was used to transport water to the houses but also as a “taxi” in town. The years of glory for Kolmannskuppe ended already after the first World War when prices of diamonds dropped. 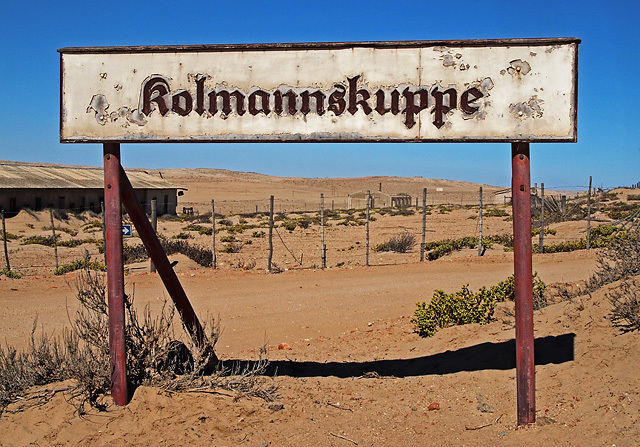 British South Africa had taken over the government from Germany, Kolmanskuppe became Kolmanskop and the diamond-fields were slowly exhausted. The first diamonds were found close to Kolmannskuppe but in 1928 new vast diamond reserves were found in fields further south near Oranjemund. Much of the mining moved south and the people living in Kolmanskop followed, sometimes taking nothing and leaving their houses fully furnished. 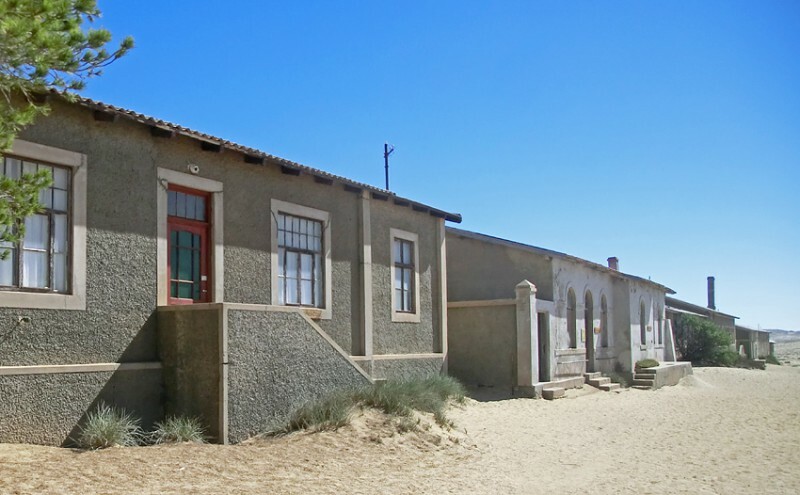 Kolmanskop remained the headquarters of CDM (Consolidated Diamond Mines) until 1943. Mining continued until 1950 and by 1956 the town was deserted. As the years went by windows were crushed and sand started filling the houses. Today Kolmanskop is a very popular tourist destination, especially for photographers. Several movies and TV-series has used the town. It is run by the joint firm NamDeb (Namibia-De Beers). The town is still within the Sperrgebiet so you need a permit to visit it. This you get at the gate. Beautiful pictures in your Kolmanskop series. Wish I could go there again – it is such an interesting place! Thank you Michael. I agree it is an interesting place. You don’t have to prebook. Just go there, pay a small entrance fee and park your car. There are guided tours at certain hours but you can also walk around yourself. I did a bit of both. The “town” is small and you just walk around it. Some parts are not accessible.